As an Aussie, I like my Vegemite! I don’t eat it often, mostly because I rarely have toast for breakfast, but like most Australians, I was born and bred on the stuff so when I do have it, I enjoy it. The standard way to eat Vegemite is lightly smeared on buttered toast, or on fresh bread with (hard) butter, or perhaps with cheese. Other options I’ve tried and enjoyed are with cheese and celery, and even just with celery. 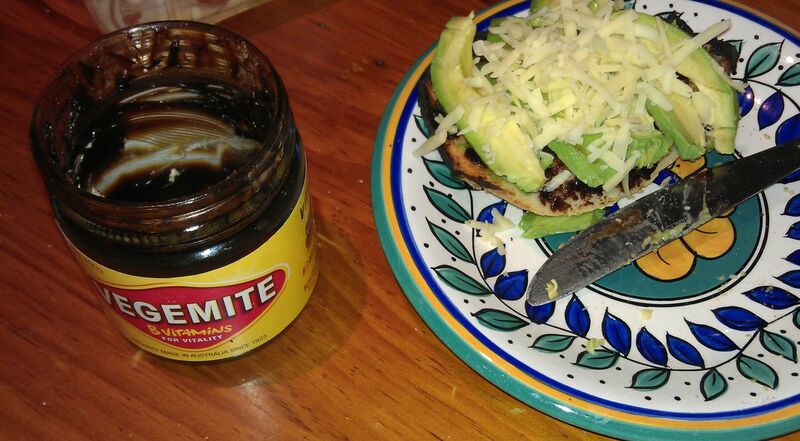 On my recent quilting retreat weekend away, I toasted the crusty end of a loaf of bread and was going to have it with avocado, but one of the girls suggested Vegemite then avocado and then topped with cheese. Yummo! It was great! I’ll add that one to my breakfast repertoire. Vegemite is a food product that’s been available in Australia for 75? years or more. It is extremely high in the B vitamins and is made from brewer’s yeast. To the rest of the world it tastes pretty foul, but as most Australians start eating it on toast or bread from a very young age (i.e. 12 months or even younger) we have an acquired taste for it. It is very salty and has the consistency of axle grease… Some would even say it tastes like axle grease! It’s almost black in colour as you can see from the photo, and is excellent in stews and gravies (no more than a teaspoon or so). If you’re ever offered it spread it VERY thinly on toast… Just a smear for newcomers. It is available in some specialty stores in the United States or online, and in some cities where there’s a strong ex-pat Australian community such as Houston, Calgary etc. Thank you, Mary, for asking and Rhonda for your explanation. I think I will pass on this one. I can’t think of many foods I would pass on (lutevisk is one, though!) but ………………………………LOL! I totally agree, TM. This is not on my bucket list, that’s for sure! It has no molasses in it — the nutrition label says <0.1 g of carbohydrates/sugar, <0.1 g fats, and 173 mg sodium (8% recommended daily intake) per serve.